Este ensaio também está disponível em português. As I make a checklist of all the things I’ll have to pack to travel from São Paulo to Berlin, to attend WordCamp Europe 2019, I can’t stop thinking how hard the path to this point has been. For some of people, a travel like this may seem ordinary, but for me, this will be the farthest I’ve ever been until now, in many ways. Especially because the last time I was planning to attend an international WordCamp, things didn’t work out at all. So let me tell you about the path. I was born and raised in São Paulo. Allow me to give you some context about my city. São Paulo is the richest and biggest city of Brazil. With more than 14 million people, it’s also the biggest city of the south hemisphere. It’s even bigger than New York. Like every big city, São Paulo is a place of opportunities, but also a place of contrasts. Growing up, although we were poor, my family cared a lot about the education of me and my little brother. My father who always liked technology, managed to get a computer for us in 1996. At that time, I was 6 years old, and we were the only family in my neighborhood to have a computer for a long time, and that was sad. That early exposure to technology made a big difference in my life. At age 13, I was very interested in graphic design and coding. We had a very limited and expensive dial-up internet, that was only free after midnight and at weekends. So to learn these skills, my best options were the CD-ROM magazines that my father would bring home. I also learned about HTML with a book about Microsoft Front Page. At age 14 I sold my first website, entirely created on Front Page, with lots of GIFs and <marquee> tags, for a neighbour who needed it for a college project. She loved it! I decided I wanted to work with design. So I started a Graphic Design course during the high school. With my love for web design, all I wanted was to have a site that was actually online. I couldn’t afford a host, but fortunately at this time, blogs became very popular here in Brazil. I looked for a platform to create a portfolio. I played a little with one called WordPress (you may have heard of it) and ended up using Blogger instead, because there was the possibility to customize the theme’s CSS online. I made a very dark grungy theme for my blog that’s still online. I got a scholarship for Graphic Design at a good College in São Paulo, but I still would have to pay for half of the monthly tuition. The problem was that my family definitely had no means to afford it. My parents said they would cut some expenses and help me, but I knew that there wasn’t anything they could cut. So I told them to not worry, I would find a job. At this point I had made a freelance gig creating a HTML website (in Dreamweaver this time). With exactly 1 month left for the College application, this client proposed that I started working there to maintain the website I just made. So I was able to (barely) pay for the college. After six months, I applied for a full scholarship and it was granted. Things got a little better financially, but the path was still rocky. It took me 3 hours by bus from my house to the college every single day, just inside the city of São Paulo (remember when I said this city is huge?). I had the cheapest hot dog for lunch every day, because I couldn’t afford a real meal. Then I would go to work (another 1h30 of bus from the college), and at night I would head back home (another bus, another 1h30). That was my routine for one and a half year throughout the college. As you can imagine, I was exhausted, and eventually getting ill.
That’s when I decided that I would quit my job and start a business with my boyfriend Allyson Souza, that I met during my Graphic Design course in High School. We started the company officially in july, 2009. We named it Haste (the portuguese word for “stem”). We were 19 years old, not much experience, zero network and money, a lot of energy, and some extra self-confidence (I could have summarized simply as “millennials”, right?). Allyson’s father gave us a computer and a part of his office, for which I am very grateful, and we created all the graphic materiais for his courses company in exchange. We started working with graphic design only, and it took us some time to realize that web development was our future. I remembered WordPress and tried it again. I liked how the platform had evolved. We made a second version of our website in WordPress, using a simple free theme, which I edited the CSS directly (oh god). We tried to create websites for clients modifying existing themes (at least we learned about child themes later), but we definitely didn’t feel in control of what we were doing. In January 2011, my mother had a stroke. She had a brain surgery, and after a month, she was back home with a 6 inches scar in the head. That was the lowest point on my path. The next years I had to take care of her, because of some consequences of the stroke, both physical and psychological. As the only family member who hadn’t a “formal” job, with a boss and a defined schedule, I was the one who had to take her to appointments, or the ER, or stay home when she wasn’t ok. It was very hard to reconcile the final year of college, the work and my mom’s health care. At Haste, we felt that things were not evolving. In 2013, after some partnerships that took us to some confusing paths, we decided to have a complete makeover. We defined a new focus: web design and development with WordPress. We created a new website, with a theme fully developed by us. We wanted to overcome the fear of coding, and wanted to know exactly what we were doing. So we started studying a lot by ourselves. We were proud WordPress developers now. We started attending the meetups, and then the WordCamp. I was amazed how the open-source culture was all about sharing knowledge with strangers, with no fear of competition, just the spirit of collaboration. We felt no longer isolated. We made real friends (shout out to all my WordPress friends). Soon we were both involved in the community, and became WordCamp São Paulo organizers in 2014. The new website and our participation in the WordPress community were really what we needed to give us some perspective and stability. So we didn’t stop there. In the 2014 edition of WordCamp São Paulo, I was the only female speaker. That made me realize a few things. First that the proportion of men in the community events was not only the majority but, we almost didn’t had any women at all, which was very weird. Second, we know that lots of girls feel intimidated in an environment with too much men. I always had a majority of male friends since I was a kid, and even so, I probably wouldn’t get involved with the community if it wasn’t by the fact that my boyfriend / partner was with me. A few sexists incidents had happened with me too. I reacted, and the men involved seemed to understand that I wasn’t ok, and changed their behavior as far as I know. We don’t have as many meetups and WordCamps here in Brazil as in US. Although Brazil is becoming a technology hub, the WordPress community has still a lot of room to grow, compared to other communities. So, I think we have the opportunity to make things different while everything is not settled yet. So I decided to act now. I started a poll asking the women involved with WordPress the reasons why they wouldn’t attend the events. The results proved it wasn’t just me complaining about small things. Some jokes kept women away. Some condescending actions made them feel diminished. And even the lack of information from our part, that the WordCamps are inclusive events, made the women not to come. The lack of time, was an important factor too. Based on this data, the next year we managed to increase the proportion of female speakers from 5% to 32% at WordCamp São Paulo 2015. More women became organizers too. In 2019 we have 4 women out of 10 active organizers. The last WordCamp we had blind people attending, and their feedback was great. We still need to improve racial diversity though. In 2015, Allyson had told me about this new scholarship program from the WordPress Foundation for women who work for equality in the community around the world. So I applied for the very first Kim Parsell Memorial Scholarship. Kim Parsell left a beautiful legacy of inclusion and love, having worked to bring more women, older people, and other minorities to the WordPress community. She was known as the #WPMom. The result came few months later. I received an email, and had no reaction for a few minutes. I had won the scholarship, and it granted me a travel to WordCamp US 2015, in Philadelphia Pennsylvania, with flights and hotel covered. You see: I had never left my country. I had just took flight for the first time that same year. I was not even close to dream to go to US, because it was impossible for me at the moment. Sometimes your mindset in the only thing putting limitations in your dreams. I was so happy, you have no idea. Alx Block and Cami Kaos reached to me to give me instructions and they were very kind. But then… my visa application was denied. They considered my sudden passport and visa solicitation, with no money to travel (that’s exactly the point of a scholarship! ), and lack “ties” in Brazil very suspicious. I told them that the WordPress Foundation would pay for everything. The flights and the hotel were already booked. The officer even told me that the WordPress Foundation letter could be easily forged. I tried again, with no success. I couldn’t go to WordCamp US 2015. I couldn’t go to WordCamp US 2016 too, when they asked if I wanted to try again, and my visa was denied… again. This time I think at least the officer searched online for me, saw it was true, but couldn’t do anything, since my situation hadn’t change. I was so disappointed. This still hurts me, I must confess. 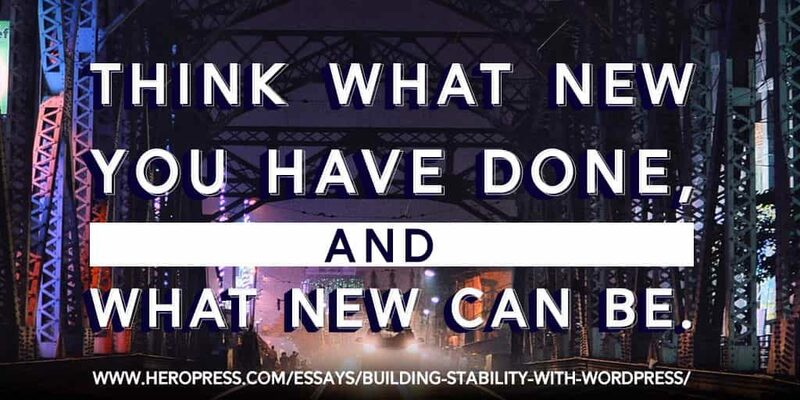 Sometimes, there are real barriers and gates that a simple mindset change cannot open. The next years, I focused on my company and the work at the community. My mom’s health improved, she’s in great shape now. My family supports my work. We became specialists in WordPress at Haste. We developed themes, plugins and sites for companies in Brazil and America. I now have a stable income and I live exclusively from my work with WordPress. We are celebrating 10 years in 2019. I traveled through Brazil because of WordPress, to speak at WordCamps and Meetups. I see more and more women working with WordPress, attending meetups and WordCamps, and talking to each other, finding something familiar in every other woman’s face. Last year we decided we would go to WordCamp Europe 2019 in Berlin, since we don’t need a visa to most countries there, including Germany. This time I can afford it (with a lot of planning and expenses cut, but I’ll be ok). I have to confess that I’m a little anxious about the immigration process. My goal at WordCamp Europe is to know the most people I can. It’s not a matter of quantity, but if the WordPress community taught me something was that every person has something to teach and to learn. So If you are attending WordCamp Europe, let’s meet! So now I hope you can see what this travel really means to me, and why every small conquest means a lot. It’s not just because it was hard. But because I’m not the only one who deserve it, but unfortunately I’m a exception between other people who have the same background as I. There are so many young girls and boys that don’t dare to dream about visiting other countries, or even getting in the college. Lots of kids that don’t have a computer, or even access to internet. The only difference is that I was given opportunities, people believed in me. Doors were opened. And just then I could prove my value. Now my next dream is to be able to make the journey a little easier than it was for me, specially for women and young Brazilians. Because I think that’s our responsibility in the community. Teach others, share information, donate some of your time, create new tools, plugins and resources, mentor people. As my brother’s tattoo says, be the person you needed when you were younger. Enquanto faço uma lista de todas as coisas que preciso para viajar de São Paulo para Berlim, para participar do WordCamp Europe 2019, não posso deixar de pensar no quão difícil foi o caminho até esse ponto. Para algumas pessoas, uma viagem como essa pode parecer comum, mas, para mim, esse será o mais longe que já fui até agora, de muitas maneiras. Especialmente porque, da última vez que eu planejava participar de um WordCamp internacional, as coisas não deram certo. Então deixe-me contar sobre esse caminho. Eu nasci e cresci em São Paulo. Permita-me dar um pouco de contexto sobre minha cidade. São Paulo é a mais rica e maior cidade do Brasil. Com mais de 14 milhões de pessoas, é também a maior cidade do hemisfério sul. É maior que Nova York. Como toda grande cidade, São Paulo é um lugar de oportunidades, mas também de contrastes. Crescendo, apesar de sermos pobres, minha família se importava muito com a minha educação e do meu irmão mais novo. Meu pai, que sempre gostou de tecnologia, conseguiu um computador para nós em 1996. Naquela época, eu tinha 6 anos, e éramos a única família das redondezas a ter um computador por um longo tempo, e isso era triste. Essa exposição precoce à tecnologia fez uma grande diferença na minha vida. Aos 13 anos, eu já estava interessada em design gráfico e programação. Nós tínhamos aquela internet discada muito limitada e cara, que só era gratuita depois da meia-noite e nos fins de semana. Então, para aprender essas habilidades, minhas melhores opções eram as revistas em CD-ROM que meu pai trazia para casa. Eu também aprendi sobre HTML com um livro sobre o Microsoft Front Page. Aos 14 anos, vendi meu primeiro site, inteiramente criado no Front Page, com muitos GIFs e tags <marquee>, para uma vizinha que precisava para um projeto da faculdade. Ela adorou! Eu decidi que queria trabalhar com design. Então fiz o curso técnico em design gráfico durante o ensino médio. Com o meu interesse pelo web design, tudo o que eu queria era ter um site que estivesse online. Eu não podia pagar um servidor, mas felizmente, neste momento, os blogs se tornaram muito populares aqui no Brasil. Procurei uma plataforma para criar um portfólio. Eu brinquei um pouco com uma plataforma chamada WordPress (você pode ter ouvido falar dela) mas acabei usando o Blogger, porque havia a possibilidade de personalizar o CSS do tema online. Eu fiz um tema escuro e grunge para o meu blog que ainda está online. Consegui uma bolsa de Design Gráfico em uma boa faculdade em São Paulo, mas ainda teria que pagar metade da mensalidade. O problema era que minha família definitivamente não tinha como arcar com isso. Meus pais disseram que cortariam algumas despesas e me ajudariam, mas eu sabia que não havia nada que pudessem cortar. Então eu disse a eles para não se preocuparem, eu encontraria um emprego. Neste momento, eu havia feito um trabalho freelancer criando um site HTML (no Dreamweaver desta vez). Com exatamente 1 mês para o aplicativo da faculdade, esta cliente propôs que eu começasse a trabalhar lá para manter o site que tinha acabado de criar. Então eu pude pagar pela faculdade (bem mal). Depois de seis meses, solicitei uma bolsa de estudos integral e ela foi concedida. As coisas melhoraram um pouco financeiramente, mas o caminho ainda era rochoso. Levava 3 horas de ônibus da minha casa para a faculdade todos os dias, apenas dentro da cidade de São Paulo (lembra quando eu disse que essa cidade é enorme?). Eu comia um cachorro-quente mais barato para o almoço todos os dias, porque eu não podia pagar uma refeição de verdade. Então eu ia trabalhar (outra 1h30 de ônibus da faculdade), e à noite eu voltava para casa (outro ônibus, outro 1h30). Essa foi a minha rotina por um ano e meio durante a faculdade. Como você pode imaginar, eu estava exausta e ficando doente. Foi então que decidi largar meu trabalho e começar um negócio com meu namorado Allyson Souza, que conheci durante o curso de Design Gráfico no Ensino Médio. Nós começamos a empresa oficialmente em julho de 2009. Nós a nomeamos Haste. Nós tínhamos 19 anos de idade, não muita experiência, zero networking e dinheiro, muita energia e alguma autoconfiança extra (eu poderia ter resumido simplesmente como “millennials”, certo?). O pai do Allyson nos deu um computador e uma parte de seu escritório, pelo que sou muito grata, e criamos todos os materiais gráficos para sua empresa de cursos em troca. Começamos a trabalhar apenas com design gráfico e levamos algum tempo para perceber que o desenvolvimento web era o nosso futuro. Lembrei-me do WordPress e tentei novamente. Eu gostei de como a plataforma evoluiu. Fizemos uma segunda versão do nosso site no WordPress, usando um simples tema gratuito, que eu editei diretamente o CSS (não façam isso!). Tentamos criar websites para clientes que modificando temas existentes (pelo menos aprendemos sobre temas filhos mais tarde), mas definitivamente não nos sentíamos no controle do que estávamos fazendo. Em janeiro de 2011, minha mãe teve um AVC. Ela fez uma cirurgia no cérebro, e depois de um mês, ela estava em casa com uma cicatriz na cabeça. Esse foi o ponto mais baixo do meu caminho. Nos anos seguintes eu tive que cuidar dela, por causa de algumas consequências do AVC, tanto físicas quanto psicológicas. Como a única pessoa da família que não tinha um emprego “formal”, com um chefe e um horário de trabalho definido, fui eu quem teve que levá-la às consultas, ao pronto-socorro ou ficar em casa quando ela não estava bem. Foi bem difícil conciliar o último ano da faculdade, o trabalho e cuidar da saúde da minha mãe. Na Haste, sentimos que as coisas não estavam evoluindo. Em 2013, após algumas parcerias que nos levaram a caminhos confusos, decidimos fazer uma reformulação completa. Definimos um novo foco: web design e desenvolvimento com WordPress. Criamos um novo site, com um tema totalmente desenvolvido por nós. Queríamos superar o medo de programar e queríamos saber exatamente o que estávamos fazendo. Então começamos a estudar muito por conta própria. Nós começamos a frequentar os meetups, e depois o WordCamp da comunidade WordPress. Fiquei espantada com a forma como a cultura de código aberto era toda sobre compartilhar conhecimento com estranhos, sem medo de competir, apenas o espírito de colaboração. Não nos sentíamos mais isolados. Nós fizemos amigos de verdade (alô amigos do WordPress). Logo nos envolvemos na comunidade e nos tornamos organizadores do WordCamp São Paulo em 2014. O novo site e nossa participação na comunidade WordPress foram realmente o que precisávamos para nos dar alguma perspectiva e estabilidade. Então nós não paramos por aí. Na edição de 2014 do WordCamp São Paulo, eu era a única palestrante mulher. Isso me fez perceber algumas coisas. Primeiro, a proporção de homens nos eventos da comunidade não era apenas a maioria, mas quase não tínhamos nenhuma mulher. O que era muito estranho. Em segundo lugar, sabemos que muitas mulheres se sentem intimidadas em um ambiente com muitos homens. Eu sempre tive a maioria de amigos homens desde criança, e mesmo assim, eu provavelmente não me envolveria com a comunidade se não fosse pelo fato de meu namorado / sócio estar comigo. Alguns incidentes sexistas também aconteceram comigo. Eu reagi, e os homens envolvidos parecem ter entendido o problema, e mudaram seus comportamentos até onde eu sei. Não temos tantos meetups e WordCamps aqui no Brasil como nos EUA. Embora o Brasil esteja lentamente se tornando um polo de tecnologia, a comunidade WordPress ainda tem muito espaço para crescer, em comparação com outras comunidades. Então, acho que temos a oportunidade de fazer as coisas diferentes enquanto tudo ainda não está definido. Então eu decidi mudar isso. Eu comecei uma pesquisa perguntando às mulheres envolvidas com WordPress quais eram as razões pelas quais elas não compareciam aos eventos. Os resultados provaram que não era só eu reclamando de pequenas coisas. Algumas piadas mantinham as mulheres afastadas. Algumas ações condescendentes fizeram com que se sentissem diminuídas. E mesmo a falta de informação de nossa parte, de que os WordCamps são eventos inclusivos, fez com que as mulheres não viessem. A falta de tempo também foi um fator importante. Com base nesses dados, no ano seguinte conseguimos aumentar a proporção de mulheres palestrantes de 5% para 32% no WordCamp São Paulo 2015. Mais mulheres se tornaram organizadoras também. Em 2019, temos 4 mulheres de 10 organizadores ativos. No último WordCamp, tivemos deficientes visuais comparecendo e o feedback deles foi ótimo. Ainda precisamos melhorar a diversidade racial. Em 2015, Allyson me contou sobre o novo programa de bolsas de estudos da Fundação WordPress para mulheres que trabalham pela igualdade na comunidade em todo o mundo. Então me inscrevi para a primeira bolsa Kim Parsell Memorial. Kim Parsell deixou um lindo legado de inclusão e amor, tendo trabalhado para trazer mais mulheres, pessoas mais velhas e outras minorias para a comunidade WordPress. Ela era conhecida como a #WPMom. O resultado veio alguns meses depois. Recebi um email e não tive reação por alguns minutos. Eu tinha ganhado a bolsa que me garantia uma viagem para o WordCamp US 2015, na Filadélfia, na Pensilvânia, com voos e hotel cobertos. Veja bem: eu nunca tinha saído do meu país. Eu tinha acabado de voar de avião pela primeira vez naquele mesmo ano. Eu não estava nem perto de sonhar em ir para os EUA, porque era impossível para mim no momento. Às vezes sua mentalidade na única coisa colocando limitações em seus sonhos. Eu estava tão feliz, você não faz ideia. Alx Block e Cami Kaos entraram em contato para me dar instruções e foram muito gentis. Mas então… meu pedido de visto foi negado. Eles consideraram minha solicitação repentina de passaporte e visto, sem dinheiro para viajar (esse é exatamente o ponto de uma bolsa de estudos! ), e a falta de “laços” no Brasil muito suspeitos. Eu disse a eles que a Fundação WordPress pagaria por tudo. Os voos e o hotel já estavam reservados. O oficial até me disse que a carta da Fundação WordPress poderia ser facilmente falsificada. Eu tentei de novo, sem sucesso. Eu não pude ir para o WordCamp US 2015. Eu também não pude ir ao WordCamp US 2016, quando eles perguntaram se eu queria tentar novamente, e meu visto foi negado… de novo. Desta vez, acho que pelo menos o oficial pesquisou on-line por mim, viu que era verdade, mas não conseguiu fazer nada, pois minha situação não mudara. Eu estava tão desapontada. Ainda fico triste de lembrar, devo confessar. Às vezes, existem barreiras e portões reais que uma simples mudança de mentalidade não pode abrir. Nos anos seguintes, concentrei-me em minha empresa e no trabalho na comunidade. A saúde da minha mãe melhorou, ela está em ótima agora. Minha família apóia meu trabalho. Nós nos tornamos especialistas em WordPress na Haste. Desenvolvemos temas, plugins e sites para empresas no Brasil e na América. Agora tenho uma renda estável e vivo exclusivamente do meu trabalho com o WordPress. Estamos comemorando 10 anos em 2019. Eu viajei pelo Brasil por causa do WordPress, para falar em WordCamps e Meetups. Fui para Fortaleza, Belo Horizonte, Curitiba, Porto Alegre. Eu vejo mais e mais mulheres trabalhando com o WordPress, participando de meetups e WordCamps, e conversando, encontrando algo familiar no rosto das outras mulheres. No ano passado, decidimos que iríamos para o WordCamp Europa 2019 em Berlim, já que não precisamos de visto para a maioria dos países, incluindo a Alemanha. Desta vez, posso pagar (com muito planejamento e redução de despesas). Tenho que confessar que estou um pouco ansiosa com o processo de imigração. Meu objetivo no WordCamp Europa é conhecer o máximo de pessoas que posso. Não é uma questão de quantidade, mas se a comunidade do WordPress me ensinou algo foi que cada pessoa tem algo para ensinar e aprender. Então, se você estiver participando do WordCamp Europa, vamos nos conhecer! Então agora eu espero que você possa ver o que essa viagem realmente significa para mim, e porque cada pequena conquista significa muito. Não é só porque foi difícil. Mas porque eu não sou a única que merece isso, mas infelizmente sou uma exceção entre outras pessoas que têm o mesmo histórico que eu. Há tantas meninas e meninos que não se atrevem a sonhar em visitar outros países ou até mesmo entrar na faculdade. E quando se atrevem, tem seus sonhos podados. Muitas crianças que não têm computador nem acesso à internet. A única diferença é que me foram dadas oportunidades, as pessoas acreditaram em mim. Portas foram abertas. E só então eu pude provar o meu valor. Agora meu próximo sonho é poder tornar a jornada um pouco mais fácil do que foi para mim, especialmente para mulheres e jovens brasileiros. Porque acho que é nossa responsabilidade na comunidade. Ensine outras pessoas, compartilhe informações, doe um pouco do seu tempo, crie novas ferramentas, plugins e recursos, oriente as pessoas. Como diz a tatuagem do meu irmão, seja a pessoa de que você precisava quando era mais jovem. 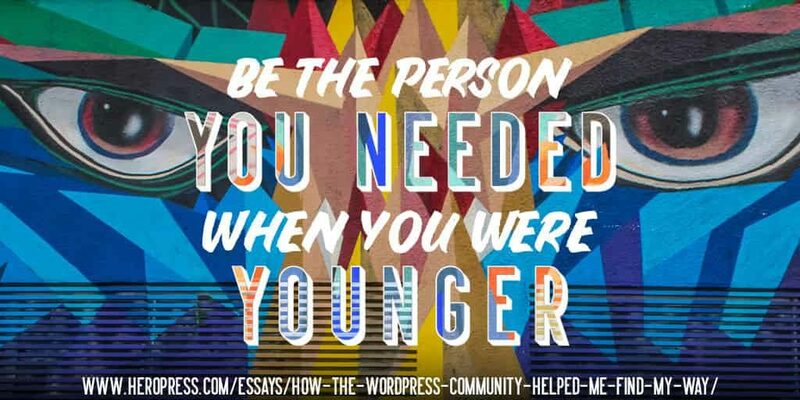 The post How the WordPress community helped me find my way appeared first on HeroPress. 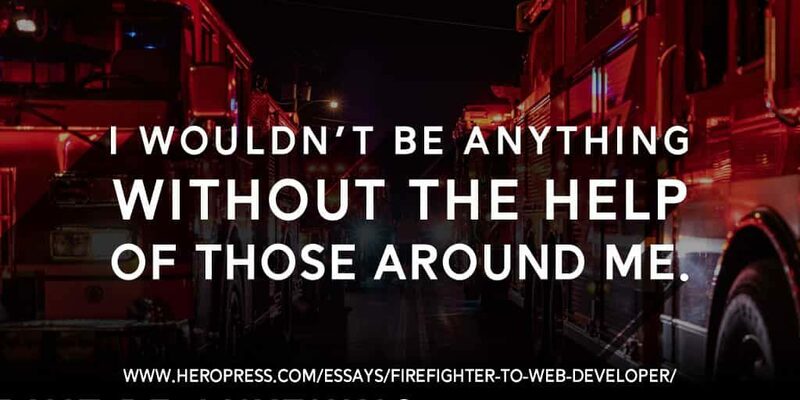 The post Firefighter to Web Developer appeared first on HeroPress. As React (via Gutenberg) becomes more present in the WordPress world, I’m seeing some common themes pop up in conversations about it. I spoke a bit about this kind of thing at WordCamp US last year, but if you don’t feel like sitting through a half hour video, let me summarise my thoughts. Over the past year or so, I’ve been tinkering with a tool to help deal with the difficulties of contributing to WordPress. That tool is called TestPress, it’s getting pretty close to being usable, at least on MacOS. Windows support is a little less reliable, but getting better. If you enjoy tinkering with tools, too, you’re welcome to try out the development version, but it does still has some bugs in it. Feedback and PRs are always welcome! There are some screenshots in this issue that give an idea of what the experience is like, if you’d like to check it out that way. This is an aggregation of blogs talking about WordPress from around the world. If you think your blog should be part of this site, send an email to Matt. For official WordPress development news, check out the WordPress Core Blog.